Studies “Medical and Pharmaceutical Biotechnology” at the IMC UAS in Krems (Austria) where she also completed her Bachelor. For her bachelor thesis she worked at the King’s College London focusing on the investigation of genes in DRPLA (Dentatorubral-pallidoluysian atrophy) Drosophila models. 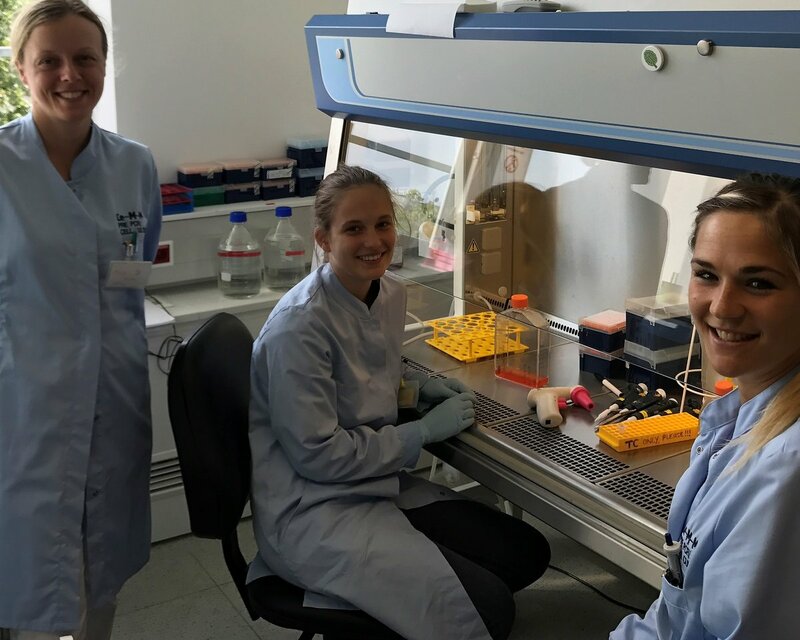 After internships at the LBI for Experimental and Clinical Traumatology and the Medical University Vienna (Center of Pathobiochemistry and Genetics, Austria), she joined the Superti-Furga group for her Master thesis. Her research concentrates on studying genes influencing the expression of SLCs. Thereby, Nadine will be supervised by Ruth Eichner. 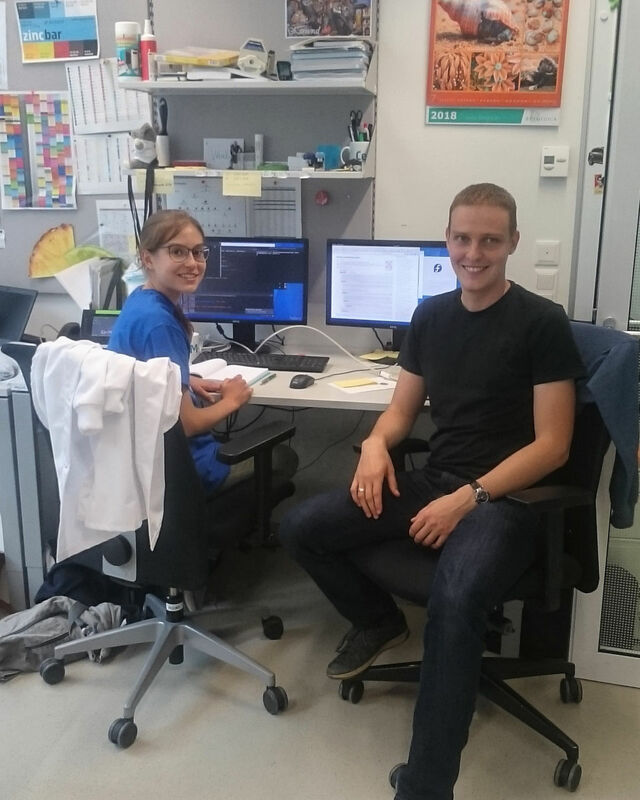 Interested in science and programming, Alexandra Waldherr works on implementing a sorting approach for sequencing and genome annotation data together with Vitaly Sedlyarov. The work at CeMM allows Alex to improve her Python-programming skills, as well as getting familiar with data structures, syntax and modules typically used in computational biology. 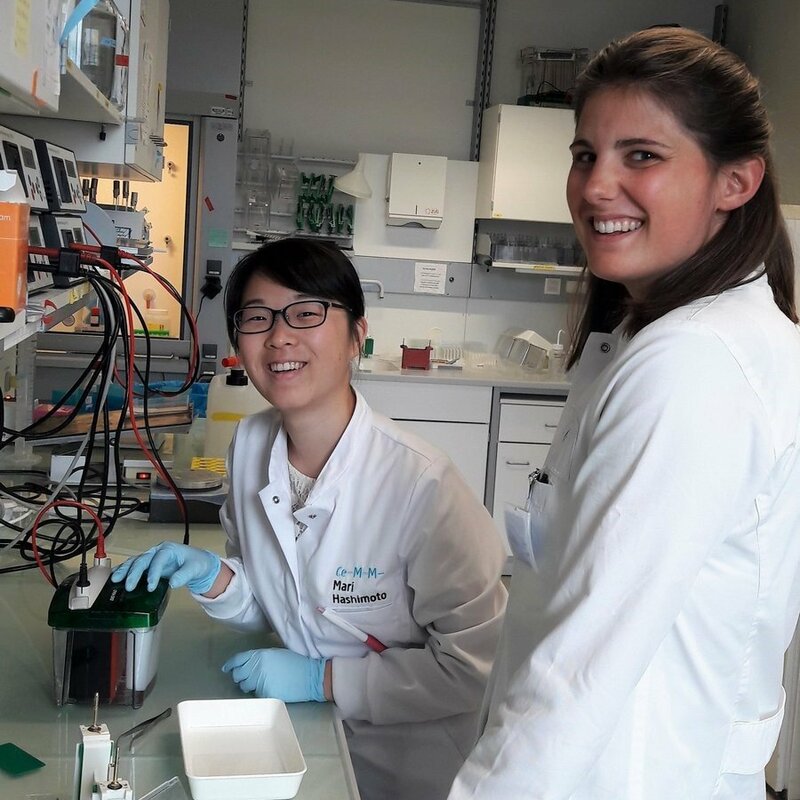 As a student of the HBLVA Rosensteingasse in Vienna, laboratory work is equally important for her: She gets the opportunity to help working on solute-carrier projects and is introduced to various laboratory methods by Patrick Essletzbichler. 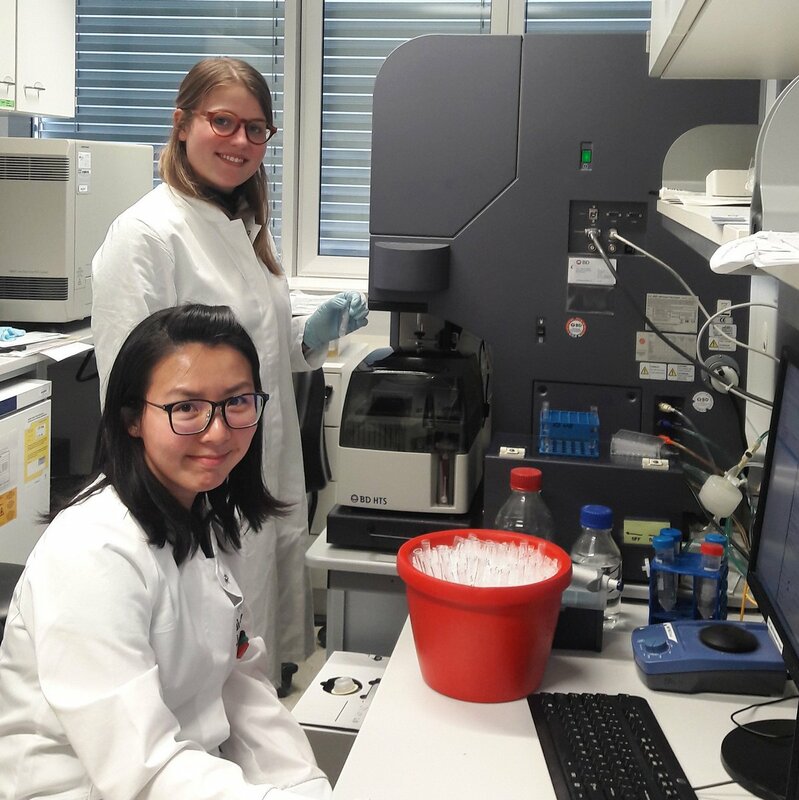 Ida and Teresa are students in their last year at HBLVA17 Rosensteingasse, a higher secondary technical and vocational school for chemical industry. Currently they are doing a five-week internship at the GSF-lab under the supervision of Ruth Eichner during which they work on a small project that will be part of their high school graduation. They are investigating a certain SLC protein and its regulatory mechanisms using laboratory techniques like the CRISPR-Cas9 technology, FACS, western blotting and tissue culture. 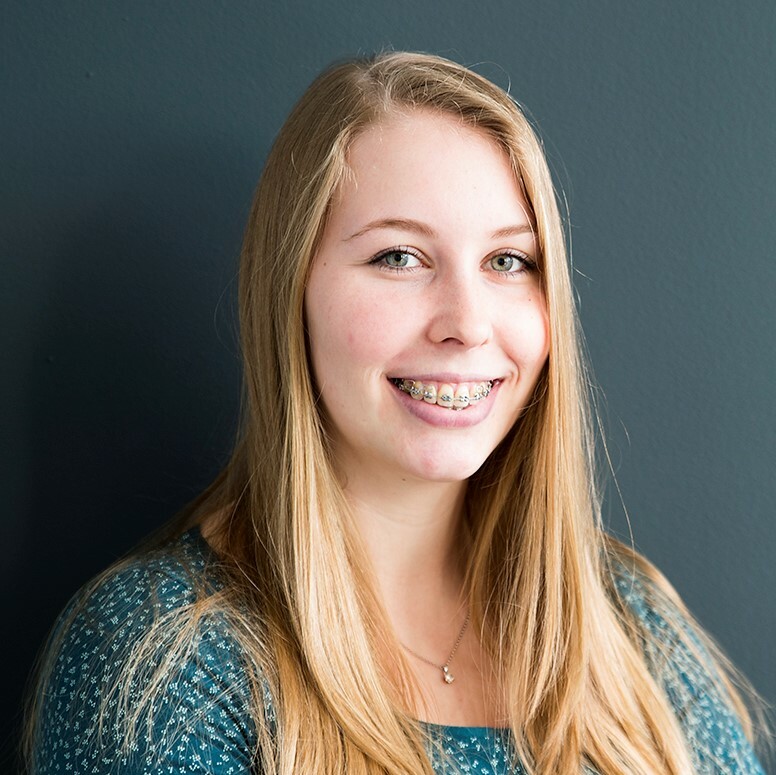 Having finished her A-levels in Stuttgart in July 2017, she is currently doing a Gap Year to gain practical experience before starting her bachelor studies in biochemistry at ETH Zurich in autumn 2018. 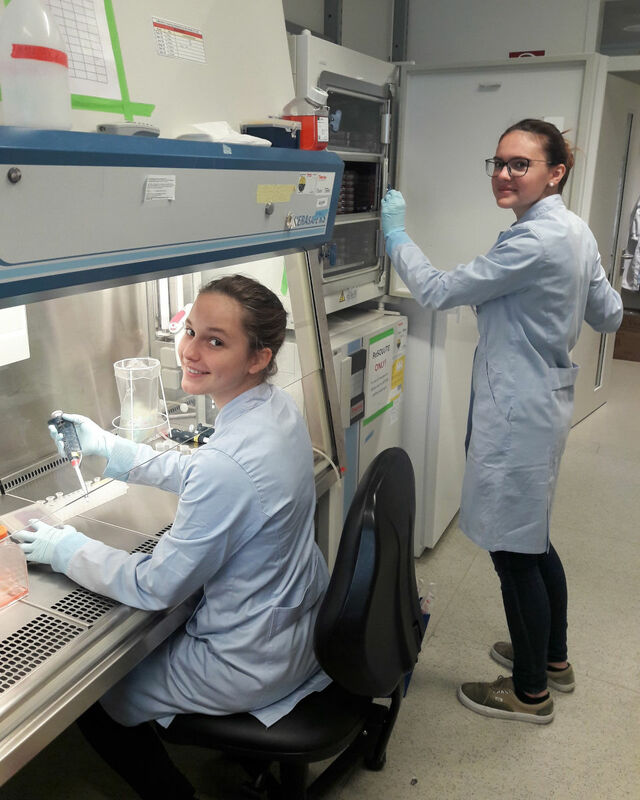 After several internships in hospitals in Germany and Switzerland, she is now getting insights during a four weeks internship at CeMM on daily laboratory work, like PCR, DNA extraction, microscopy, PAGE-gels and work in the tissue culture. He is studying Medicine at Karl Landsteiner University in Krems in his 8th semester and is currently doing a one month internship working with Ruth Eichner and Tea Pemovska (Postdoctoral Fellows) on their solute carrier studies. During his time at the GSF lab he will gain insights into laboratory techniques like cell culture, immunoblots, PCR, DNA transfection and flow cytometry. She is studying Biophysics (Bachelor Studies) in her 3rd year at the Humboldt-Universität in Berlin. Currently she is doing a one month internship with us, working with Kai-Chun Li (Postdoc) on the solute carrier essentialome project. During her time with us, she will gain insights into the experimental day-to-day life and working with viruses. In addition, she is going to collect experiences in general laboratory techniques like tissue culture, DNA extraction, flow cytometry and PCR. She is student in her 4th year at HBLVA17 Rosensteingasse, a higher secondary technical and vocational school for chemical industry. Currently she is doing a one-month internship with us, during which she is working with Manuela Bruckner and Stefania Scorzoni (TAs) under the supervision of Manuele Rebsamen (PostDoc) on the solute carriers project. During this month with us, she will collect first experiences on general laboratory techniques like tissue culture, CRISPR-Cas9 technology, proteomic sample preparation, PCR, cloning, mice genotyping and western blotting. Studying Medicine at Medical University Vienna in her 2nd semester and at University of Applied Arts in her 4th semester. 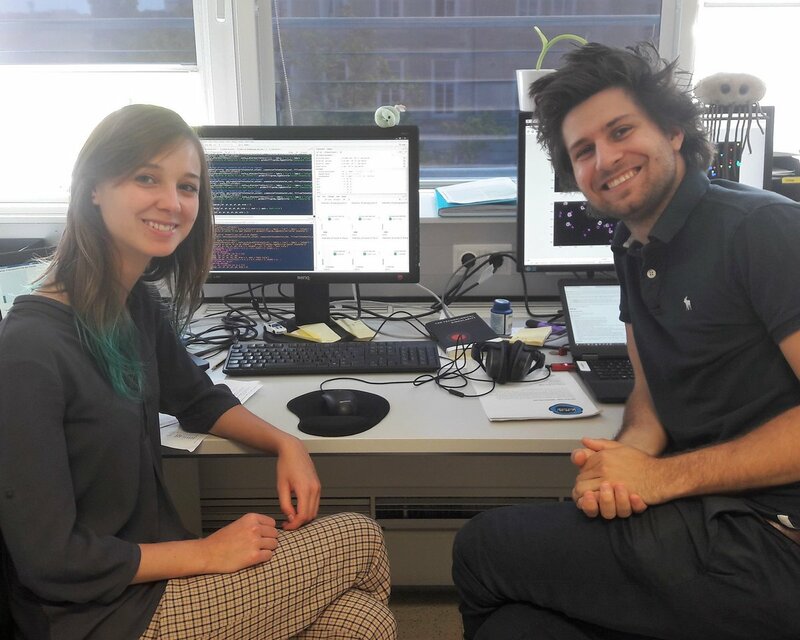 Currently she is doing a one month internship with us, working with Felix Kartnig (PhD Student) on high-content-high-throughput-microscopy and data analysis. 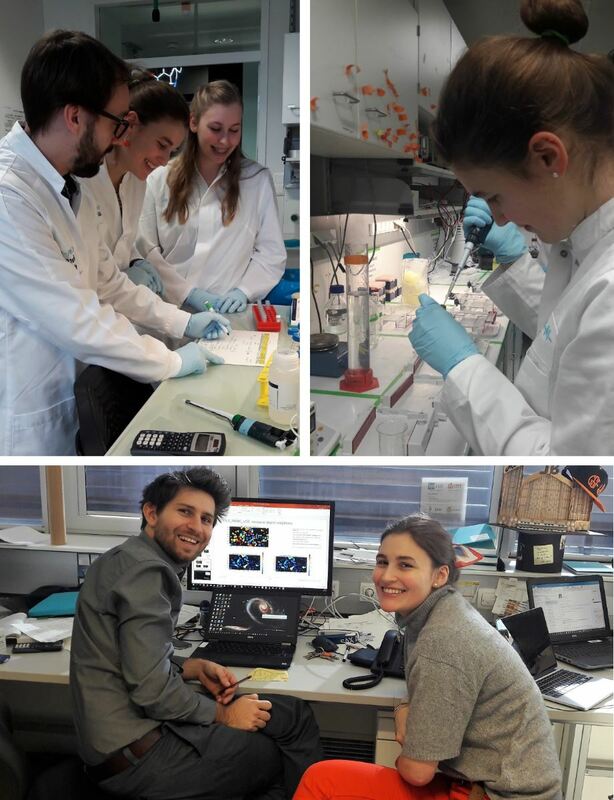 During her time with us she will get insights into all steps of the experimental workflow; from sample preparation and tissue culture, via fixation, staining and imaging to the analysis, using CellProfiler and the programming language R.
Studying physics at the University of Vienna in his 4th semester (Bachelor Studies). Currently he is doing a one month internship at CeMM with us. 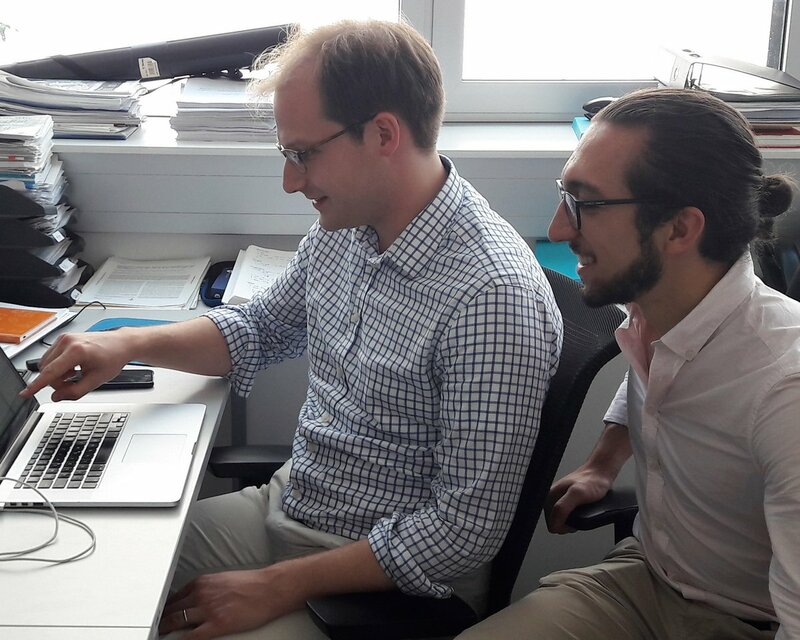 He is working with Nikolaus Krall (PostDoctoral Fellow) on data analysis and the study of cell-to-cell-interactions. 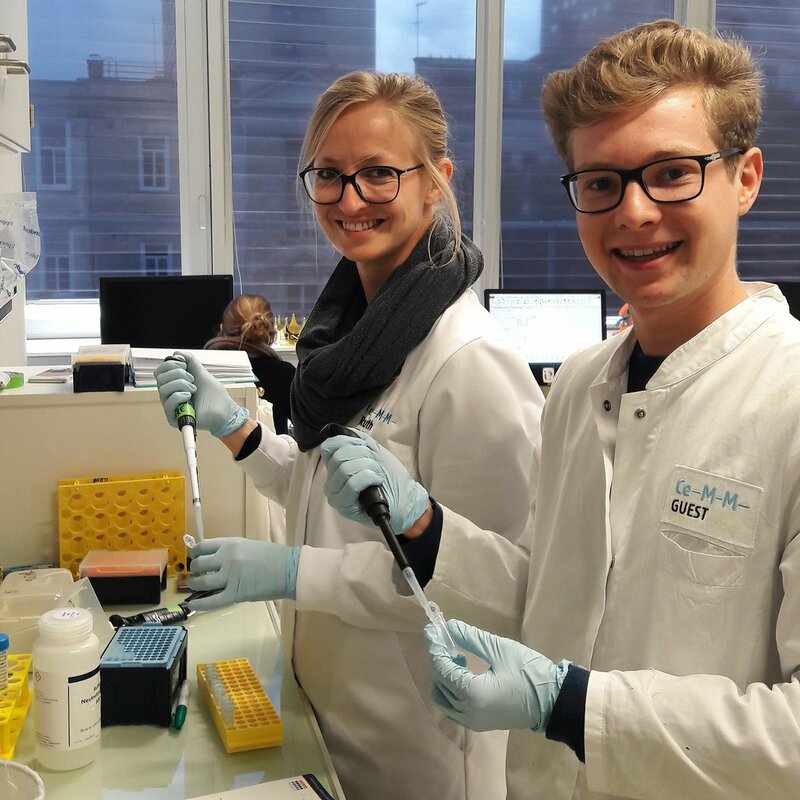 During his internship he will get an insight into general laboratory methods, cell staining, imaging and analyzing the extracted data through the programming language R.
Studying Nutritional Sciences (Bachelor Studies) at Universität Wien, Faculty of Life Sciences in her last semester. Currently she is doing a one month internship with us, in which she is working with Mari Hashimoto (PostDoc) on her solute carrier studies. During her time with us, she will get an insight into general laboratory methods like Tissue culture, qPCR, RNA extraction, CRISPR and FACS. We are always looking for motivated and talented students and interns. If you are interested in our group and want to join for an internship or a thesis project, please send an email to gsuperti@cemm.at with your CV and a letter of motivation.